I assume you checked all suggestions I send to Bob last week. If there is additional dose but not to an extend were it leads to radiation damage, I would expect more thon-rings at lower frequencies, not less. Even if the film is overdeveloped considering its exposure, the grain size would not be so large that you don't see any information at all. Can you see huge difference in grain size under a light microscope between light and dark negatives? - Completely fill the Film Text area with something (#####): this is handled by the plate labeling unit which has it's own exposure control. For a Titan, be sure to set "Data Int." to 2 (Plate Camera control panel, Settings flap-out, "Data int."). Any difference in OD of the both the exposure and the film text compared to other negatives would indicate a film/development issue. As the film most probably is developed in the same batch, the film would then be the main suspect. - Normally, CCD cameras use an external signal to trigger the blanker through hardware, but since you have an Eagle camera, this uses the same software blanking as LowDose. Is the beam current (gun) stable? Intensity changes leading to this amount of change in OD might not be that apparent on the fluorescent screen. CCD images might mask this by auto-contrast/brightness, is the average intensity of the CCD images always as expected? This however does not explain the total loss of thon-ring information, it just explains the difference in OD if it is just a dose issue. - Are you working around the same objective lens value? If you have strong convergent or divergent illumination, a large objective lens change (many microns needed to focus the image) might cause a change in beam size as the microscope has a  single field condenser-objective lens. If you had the exposure log running you should be able to check this as the Exposure Log stores all lens values (and more) for all film exposures. - Are you tweaking the back focal plane for the diffraction pattern to be in focus (beam settings control panel)? This changes the beam convergence which can lead to the previous point. > We are encountering a serious issue collecting film using our Titan (not Krios) with the Tecnai low dose kit. Certain images appear to be severely over-exposed, while others appear to be normal, high quality, low-dose exposures. Here are two examples of images collected during the same session, from the same cartridge of film, one right after another. 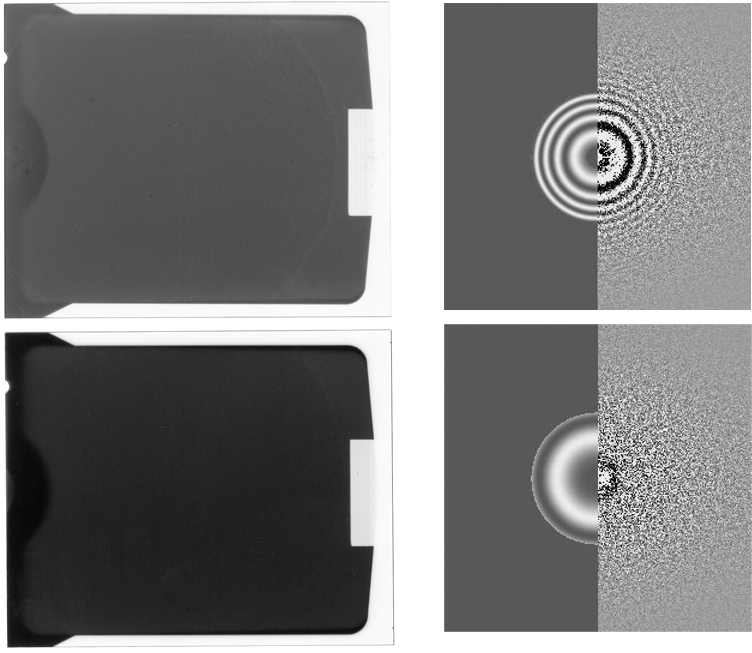 > The top image is of good quality, exhibits Thon rings to around 5Å, while the one below it has no discernible Thon rings, and is overall much darker in appearance. We can only assume that this is due to overexposure of the film to the beam, but not to the extent that we see obvious radiation damage to the sample (no bubbling). We've monitored the blanker during the exposures, and according to all the readouts in the Tecnai software it is working properly. The film is inserted into the microscope and waits for 10 seconds before exposing the film. Multiple users are having this issue. > Also, we never seem to have this problem when collecting CCD images. > If anyone has ever experienced this issue or has any insights into what is happening, we would be most appreciative.